Another banner day. The snow warmed a little yesterday, then froze really hard overnight creating excellent race conditions. Temps stayed cool all day, so the course held up well. Scott logged 11 full-on, 50-60 second long, GS runs. He's getting the hang of the new gear. Still has the occasional timing issue, but in all put down some super runs. We're setting courses at 25 meters for the first 3-5 gates rolling into a pitch, followed by about 27 meters the rest of the way. Pretty good off-set to make them work and bring force across transitions. Speeds only running around 40 MPH, but good for the objectives. 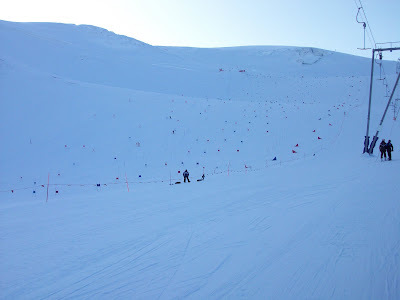 Tomorrow we'll run full timed courses to end this GS sequence. Every day I get more excited about the equipment set-up. Scott has the strength to use the stiffer boots and is learning the smaller sweet spot and quicker responsiveness. Can't wait to see these work on injected snow. The "day three doldrums" have definately set in. Everyone is looking a little haggard around here. We'll get through tomorrow, then switch to Slalom for four days. That, plus some acclimatization, should bring back some energy. Great day on snow. Started early with 6:30 tram to the glacier. Filled with WC coaches non-plused by the scenery. I was amazed by it. The Matterhorn was a muted shadow against the late night sky. Everything was still and beautiful. OK, enough of that stuff, let's talk skiing. Great hard snow and plenty of vertical. Set a 38 gate GS today in two sections. Trained for about 4 hours. French team on the left, Crotia (with Kostelic) two lanes to the right. Scott was feelin' it. His stiffer boots/skis combo allows him to ski the longer line, yet still complete the carve. I think the summer of monster workouts played a role in this as well. He had three stellar runs, a few good runs, and a couple where he experimented and over-reached. A solid second day on skis and already noticeably faster than last year. What a great day! 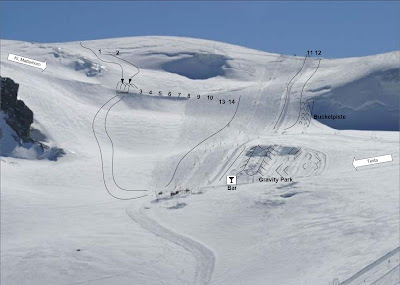 Sunshine, moderate temps and high quality snow. 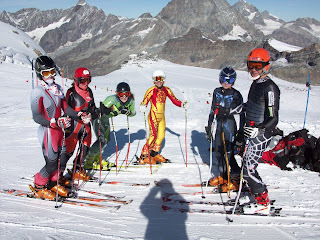 The group free skied today and got their feet back under them. Scott is pretty excited about the new set-up this year. The skis are stiffer and have a smaller sweet spot, but when combined with the stiffer (150 flex) boots, they're "like the difference between your Subaru and a Porsche. " Hmmm, I wonder when he drove a Porsche. I'm also tired of my fine ski car being maligned... Notwithstanding, the "Porsche" was a little touchy at first, but by day's end Scott was dialing in. Tomorrow I'm out of here by 6:30 AM to set a GS course and we'll see for sure. The training area is great. 12000-13000 feet high on a glacier. Well groomed. Two fast T Bars to ride, lots of space. About six national teams are here right now. We skied to Italy for lunch (Yes, the Thor's sticker is still on the top step, Brandon) then returned for two more hours. The commute is a trip. We hike 1 KM downhill to the Tram, ride three different trams to the top, walk through a 100yard tunnel and emerge at the glacier. Coming home took about 90 minutes including the uphill slog with gear. Yeah, this'll get us ready for ski season. Prepped the skis tonight for the first of our ski wax tests. Have two products fresh from the shop to try. We're settled in Zermatt and what a great day! It stated a little early though, with Scott waking at 1 AM due to jet lag. He went to the hotel gym and lifted weights for 2.5 hours while I tried to get back to sleep. At 4 I threw in the towel and we took the 5 AM train to Zermatt. Never rode a train up such a steep grade. Extraordinary scenery with hanging glaciers, water falls and chalets hanging from the most improbable spots. We're in the hotel now, reunited with skis, bindings back on and adjusted. We ski GS tomorrow. Three gondolas to the snowfields. I hear the snow is cold and hard. Can't wait! Yeah, that would be me. I packed everything except the power cord to the computer. Best FEDEX can do is Sep 30, so these posts will be brief unytil then, and absolutely no pics. Anyway, we arrived on time and intact. Hung around Zurich today (Museum, cafes, etc) and head to Zermatt tomorrow. More to follow! Another "restfull" day of packing. Well, the ski bag and each of the suitcases are exactly 50 lbs now --Lord knows what's in which one after all the adjustments. Of course the downside is that our carry-ons are about 40 lb each. Oh well. Amazing what it takes to train for two weeks -- I think I took less for a year in Vietnam! Two days until winter begins for the Independence Racing Team. It's hard to explain the effect of this accelerated schedule. Tuning and waxing 8 sets of skis since early August, walking around the house in ski boots for two hours a day to ensure fit, hours on the phone programming six months of travel, stacking wood and cleaning chimneys while everyone else is still boating and playing golf... but it's all worth it! 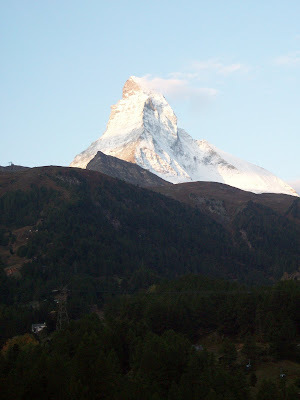 Soon we'll be in Zermatt, standing on real snow by day and consuming fondue by night. So welcome to day one of my new blog. Scott has one of his own which will give the racer's perspective. Mine will be the reality of travel, tuning, coaching, waxing and parenting -- ho humm.